Now let´s go to the chapter!. Chapter 17: Chrono Vs. Tokoha. We start with Tokoha that has brought food to her brother´s House, Mamoru, they talk about some truly nice bread!. In the day that follows that in Card Capital 2, Aki is kicking the asses of the Trinity Dragon people!. After that the Trinity Dragon Trio talks about the Regionals that will begin soon, and if you win you would go to the Nationals!. They ask if Tokoha would participate, and she refuses. They then keep questioning her about that. And she gets angry and answers violently. After that she apologizes, but still. After that Aki and Tokoha are talking and Aki asks her if she is free the Sunday, which she answers with a Yes. Yup. A girls only event!. Luckily this is a nice and pure show, so it won´t be anything dirty!. After that they go for some bread... But not any kind of bread. The ultra awesome and delicius Homemade Croquet Bread!. But they are sold out... Well, better luck next time Tokoha. But yeah, Who is the person that bought them before?. And obviously it has to be these two guys. The day after that Shion and Tokoha are talking about the festival day (see the last chapter) and how fun it was. Shion then brings the point that how lucky is Tokoha for having such an awesome brother. After School, Tokoha feels somewhat frustrated so she decides to buy some of those Croquette bread!. But They are sold out Again. The Bakery man tolds her that the person that bought it was someone who has a hair that looked like a chocolate roll. And obviously was these three Guys. And they loved it even more!. Now the Sunday has come!. Is time for some girls time!... Playing Vanguard. When they come, there are a lot of girls playing and having a good time. When Tokoha introduces herself... Those girls notices that she is Mamoru´s Sister. And they start sorrounding her!. Saying that if her Brother is stronger, she has to be too!. And Tokoha doesn´t like that kind of attention. And reminds them that they are here to fight and have fun. The Organizer told her that she didn´t have anything prepared or organized and Tokoha volunteers herself to organize the torunament. After the event is done, The organizer tells her that thanks of her the event was a success. And the others respond that "that is Mamoru´s Sister for you" and things of similar nature. Later Tokoha opens up a bit with Aki. I Truly understand you Tokoha! (My time when my Bro and I, specially him, were somewhat figures of our local Smash Bros Melee comunity). Anyway, enough of self reflecting me!. Tokoha now want some croquette bread!. And She finaly see the person that has been privating her of that godly bread!. Yup. Just as she suspected it. And they are sold out. But Tokoha isn´t sattisfied with this explication!. So they decided in the way that any Card Anime do!. Having a fight!. Anyway... Let´s just put some pictures of the fight. Oh Chrono you have to say that!. And she release her frustration and anger with Chrono!. So she releases her Grade 4 card!. And attack!... But she ten realizes her mistake. You see... Her effect is better if she is the second or the third card to attack. Chrono realizes that he maked her Angry, so he apologizes for that...But that doesn´t mean he won´t give his all in his turn!. The Skill basically sends the rear guard cards of the opponent to the deck. After that Chrono tells her that while. Yes , SHe is the sister of Mamoru Anjou, she is her own thing, a great fighter, and if both of them are strong is because both of them helped each other. Then Anjou remember her time with her brother, playing Vangaurd and eating Bread!. In the Next Turn Anjou gives her all!!... But still fall short. Chrono Wins... But she isn´t angry at all. Then Chrono decides to give her the bag full of delicious Brissquet! Bread!. Meanwhile at Card Capital 2!... Chrono is being scolded by both Kamui and Shin. Shin is afraid because he promised her Niece/Adoptive Sister, and now...Is a promise unfullfilled... And then she calls. It was...A truly good chater, not enjoyable or acceptable, it was good, but not great. 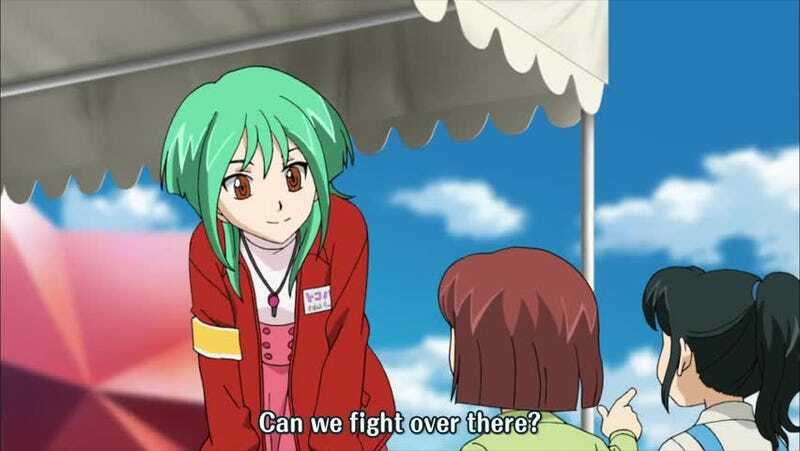 I mean, we see and know some more of Tokoha, and how she is going to fight her own problems and traumas. The letdown basically is that, in diference of the original series, in this one. It looks like the writers are afraid to let Chrono loose sometimes!. I mean in all the series he has lost (on scene) ...Like 2 times, 3 tops (One with Kouji Ibuki and the other with Mamoru Anjou). So yeah...He looks like someone unbeatable in this moment, and while is not a big deal, it detriments somewhat the inmersion and the emotion of the fights.